Just wait until you see the inside. When architect Tim Brown’s clients first met with him about designing a home in Wimberley, Texas, southwest of Austin, the couple already had an idea of how they wanted the home to look. Having lived in London for the last three years, the homeowners were drawn to traditional English folk art design, but they had also fallen in love with the simple, modern aesthetic of Scandinavian architecture. After several site visits throughout various times of the day, looking at the intrinsic qualities of the land—solar angles, topography, existing trees, geography, and more—Brown was able to design a modern ranch farmhouse that capitalized on all of the land’s stunning features. “They wanted the home to function while still being beautiful,” he explains adding that natural light in every space was a high priority. To achieve this, Brown designed a somewhat linear home, which allows for light to pour into the house throughout the day while also allowing gentle breezes to flow throughout. Simple yet meaningful gestures such as the brackets on the steel columns in the outdoor spaces and the lack of roof overhangs are a nod to Scandinavian design while the furnishings—all designed by the homeowners—are a touch more traditional. “It’s the honesty of the material,” says Brown of the architectural details throughout. 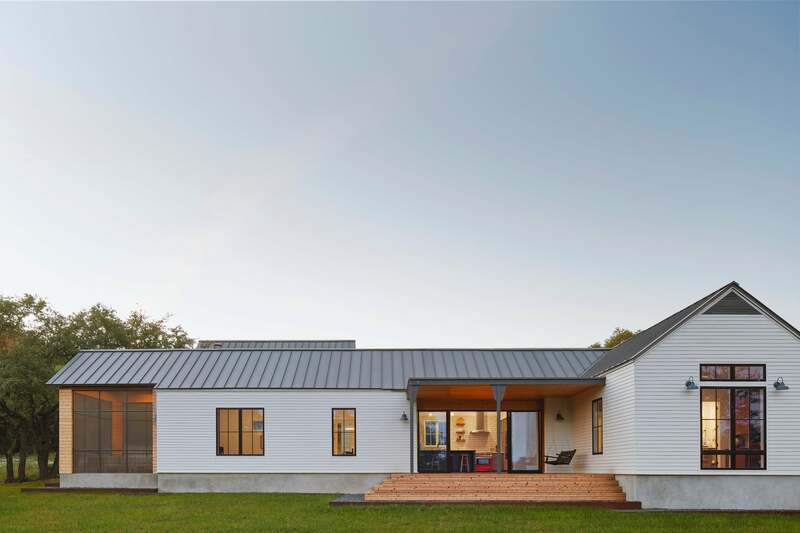 “The natural cedar, the concrete floor on the porch, there’s beauty in the rawness.” An acid-etched paint grip metal roof eventually patinas resulting in a dynamic charcoal gray that turns softer over time. To make the home as efficient in space and functionality as possible, in lieu of a garage Brown designed a carport off the outdoor living space. This doubles as not only a place to park their cars but also as a covered play area for the homeowners’ two young children, and for entertaining. “You have this cool outdoor space that wouldn’t otherwise be there if it was a garage,” he explains.